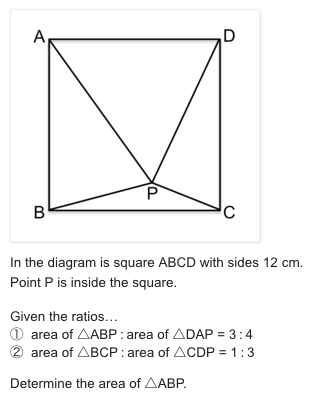 I find LOTS of great middle school problems from @Five_Triangles on Twitter. Their post two days ago was no exception. The problem requires a little stamina, but can be approached many ways–two excellent criteria for worthy student explorations. That it has some solid extensions makes it even better. Following are a few different solution approaches some colleagues and I created. The most challenging part of this problem is data organization. My first thoughts were for a 2-circle Venn Diagram–one for gender and one for age. And these types of Venn Diagrams are often more easily understood, in my experience, in 2×2 Table form with extra spaces for totals. Here’s what I set up initially. The ratio of Women:Girls was 11:4, so the 24 girls meant each “unit” in this ratio accounted for 24/4=6 people. That gave 11*6=66 women and 66+24=90 females. At this point, my experience working with algebraic problems tempted me to overthink the situation. I was tempted to let B represent the unknown number of boys and set up some equations to solve. Knowing that most 6th graders would not think about variables, I held back that instinct in an attempt to discover what a less-experienced mind might try. I present my initial algebra solution below. The 5:3 Male:Female ratio told me that each “gender unit” represented 90/3=30 people. That meant there were 5*30=150 men and 240 total people at the party. Then, the 4:1 Adult:Children ratio showed how to age-divide every group of 5 partygoers. With 240/5=48 such groups, there were 48 children and 4*48=192 adults. Subtracting the already known 66 women gave the requested answer: 192-66=126 men. While this Venn Diagram/Table approach made sense to me, I was concerned that it was a moderately sophisticated and not quite intuitive problem-solving technique for younger middle school students. WHAT WOULD A MIDDLE SCHOOLER THINK? A middle school teaching colleague, Becky, offered a different solution I could see students creating. Completely independently, she solved the problem in exactly the same order I did using ratio tables to manage the scaling at each step instead of my “unit ratios”. I liked her visual representation of the 4:1 Adults:Children ratio to find the number of adults, which gave the requested number of men. I suspect many more students would implicitly or explicitly use some chunking strategies like the visual representation to work the ratios. WHY HAVE JUST ONE SOLUTION? Math problems involving ratios can usually be opened up to allow multiple, or even an infinite number of solutions. This leads to some interesting problem extensions if you eliminate the “24 girls” restriction. Here are a few examples and sample solutions. What is the least number of partygoers? For this problem, notice from the table above that all of the values have a common factor of 6. Dividing the total partygoers by this reveals that 240/6=40 is the least number. Any multiple of this number is also a legitimate solution. Interestingly, the 11:4 Women:Girls ratio becomes explicitly obvious when you scale the table down to its least common value. My former student and now colleague, Teddy, arrived at this value another way. Paraphrasing, he noted that the 5:3 Male:Female ratio meant any valid total had to be a multiple of 5+3=8. Likewise, the 4:1 Adult:Child ratio requires totals to be multiples of 4+1=5. And the LCM of 8 & 5 is 40, the same value found in the preceding paragraph. What do all total partygoer numbers have in common? As explained above, any multiple of 40 is a legitimate number of partygoers. If the venue could support no more than 500 attendees, what is the maximum number of women attending? 12*40=480 is the greatest multiple of 40 below 500. Because 480 is double the initial problem’s total, 66*2=132 is the maximum number of women. Note that this can be rephrased to accommodate any other gender/age/total target. Under the given conditions, will the number of boys and girls at the party ever be identical? As with all ratio problems, larger values are always multiples of the least common solution. That means the number of boys and girls will always be identical or always be different. From above, you can deduce that the numbers of boys and girls at the party under the given conditions will both be multiples of 4. What variations can you and/or your students create? The 5:3 Male:Female ratio means , the same result as earlier. Winding through all of that algebra ultimately isn’t that computationally difficult, but it certainly is more than typical 6th graders could handle. But the problem could be generalized even further, as Teddy shared with me. If the entire table were written in variables with W=number of women, M=men, G=girls, and B=boys, the given ratios in the problem would lead to a reasonably straightforward 4×4 system of equations. If you understand enough to write all of those equations, I’m certain you could solve them, so I’d feel confident allowing a CAS to do that for me. My TI-Nspire gives this. And that certainly isn’t work you’d expect from any 6th grader. Given that the 11:4 Women:Girls ratio was the only “internal” ratio, it was apparent in retrospect that all solutions except the 4×4 system approach had to find the female values first. There are still several ways to resolve the problem, but I found it interesting that while there was no “direct route”, every reasonable solution started with the same steps. Thanks to colleagues Teddy S & Becky M for sharing their solution proposals. This entry was posted in problem-solving and tagged algebra, CAS, ratios. Bookmark the permalink. Although the party problem is related to factorising, LCMs and the like, we know of no mathematical term for multiple sets of ratios where the ratios need to be cross-resolved with each other, but we will suggest that this problem actually lies at the simpler end of the spectrum in this genre because all of the ratios overlap, reducing the problem to arithmetic. Solving the problem requires an extra layer of analysis to determine the connection. More than requiring stamina, it’s difficult. Agreed on all points, especially the arithmetic result of the 11:4 ratio cross-connecting the other two ratios. My stamina note was simply a recognition that far too many U.S. middle school math resources invoke only 1 or 2 ratios. Your problem introduced a lovely reasoning chain. My point on the Problem Extensions was simply that the vast majority of “school math” problems close students off from further investigation. Great mathematics is about asking and exploring “What if …?” questions. In this case, I was offering some samples of what could happen if you didn’t limit the girls to 24. The algebraic extensions acknowledge what I’ve seen in many of your problems. Even though they’re constructed for middle school students, in the proper light, they can be just as applicable for upper school students. Thanks, as always, for sharing rich, quality problems.